The Groote Schuur Community Improvement District (GSCID) has now been in operation for two years since 1 September 2010 with excellent results in the three pillars of its operations: the reduction of crime, the cleanliness of streets within the area and seeking to rehabilitate and provide employment for the homeless. These operations have been funded by levies paid to the GSCID via the City of Cape Town rates accounts by commercial and UCT properties within the GSCID boundaries along the Main Road, from Newlands to Groote Schuur Hospital and the Medical School. This is the area shown in red on the map below. As of the 1st of June this year two major additional developments have taken place. 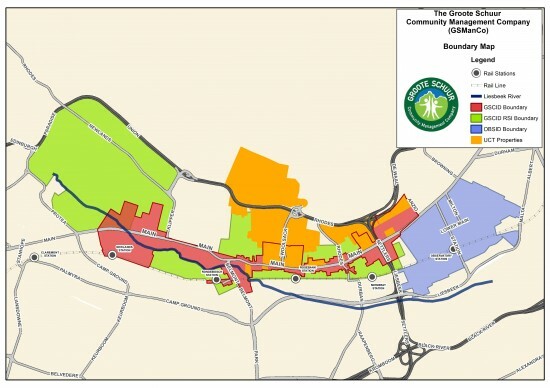 Firstly, the Observatory Improvement District (OBSID), the blue shaded area on the map, has combined with the GSCID in their security management, provided jointly by Securitas (Pty) (Ltd). Therefore, the Groote Schuur CID and the OBSID security patrols are now controlled directly from the GSCID Control Room. Secondly, in the green shaded residential areas UCT is directly funding four security patrol vehicles. These areas, along withthe OBSID area, are inhabited by considerable numbers of UCT students living in digs in neighbourhoods around the campus and around the GSCID and OBSID’s areas of operation. Their safety is naturally a major concern and has resulted in the provision of this additional security, which certainly also benefits the general public. immediate off campus commercial and residential areas stretching from Newlands to Observatory.